When I think of science fiction in terms of its long and grandiose history, I admittedly get a little lost among all the talented writers and their works. Where should I start? What should I read next to understand how this work influenced that work, etc? Hundreds of years of literary history crammed into a reading list can be rather overwhelming. 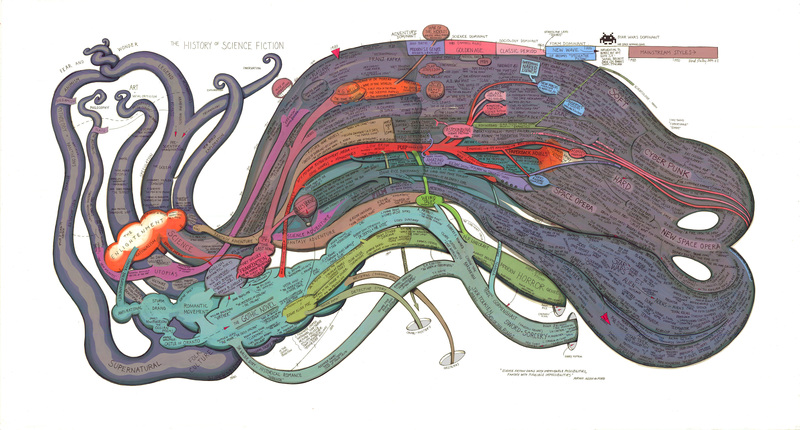 That strange looking blob is actually an elaborate history of fictional works that eventually birthed and defined science fiction and its various offshoots. Click on it to see it in all it’s detailed glory. Be warned, though. This image is huge and not at all for slow connections. If you look just to the right of Cyberpunk, you’ll even find a mention of Steampunk on the chart itself listed alongside The Difference Engine.